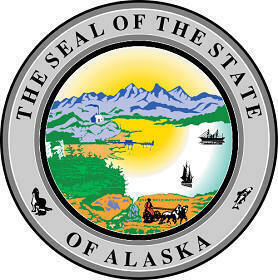 The Alaska state seal identifies government buildings and officials. The symbolism, history and emblems of the seal are described in this article with fast facts and information. The seal symbolizes many of the industries and natural riches found in the land of Alaska. In the foreground the image of a farmer, his horses stand for Alaskan agriculture. The mining industry is not forgotten and is represented by a factory with a smoking chimney that depicts smelting metal from its ore. The rays above the mountains and reflected in the water represent the Alaskan northern lights. The first seal was designed before statehood by John Henry Kinkead, the first governor of the District of Alaska which covered the period from 1884 to 1912. 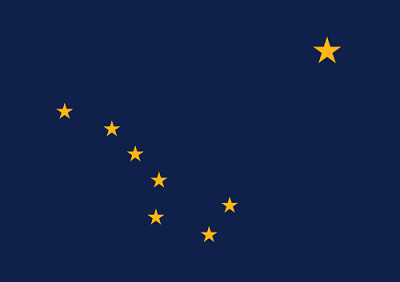 In 1912 the land became known as Alaska Territory until admission to Union on January 3, 1959 (49th state). The picture of the old flyer is interesting in respect of the reference to Russia. The Russians settled Old Sitka in 1799 under the name Redoubt Saint Michael. The flyer also features the prominence of the industries related to seals.